We have put together a range of linkable, portable pop up trade show displays, designed to be used either on their own as a freestanding unit or as part of a shell scheme booth at exhibitions and trade shows. Available in a selection of sizes, and both L and U shaped configurations, we have an option to suit a wide range of promotional needs. As each part of the system can also be used on its own, you can configure the pop up system how you wish, giving you versatility depending on your promotional requirements. Depending on the linkable pop up stand system, the hardware used is either a straight pop up stand, a curved pop up stand or a combination of the two. The whole system comes with custom printed graphics, produced in-house to deliver stunning results. 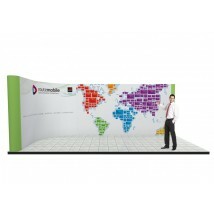 Pop up stands are one of the cornerstones of any good exhibition stand, and one of our best selling product ranges. 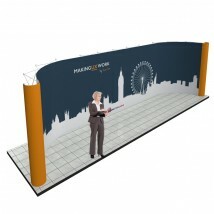 We use the same high quality hardware and superior graphic printing techniques from our individual pop up stands to create linkable pop up display systems, designed to make a big impact at exhibitions, trade shows and other promotional events. Our range of linked pop up stands can be used as they are, but are also designed to fit perfectly onto matching sized shell scheme systems. 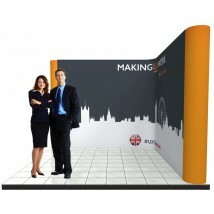 The pop up stands themselves are easily linked by ghost panels that leave a seamless edge. You can also reconfigure them as you wish, for instance just use one of the pop up stands, or join the pop ups at different angles. 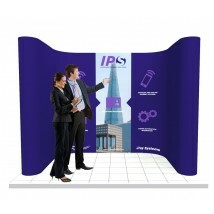 This makes our linked pop up systems one of the most versatile stand options we offer, giving you a display that can be used multiple times and one that can handle any promotional situation that is required of it. 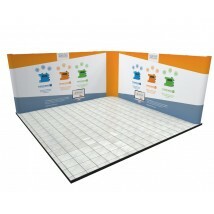 The whole system is also easy to assemble and take down, and folds down for easy transportation and storage. We even include transport drums with the system, making it easier for you to take them to your display location. 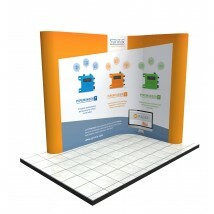 All linkable pop up stands come with custom printed graphics provided. These are produced in-house using the latest printing equipment and vibrant inks to give an eye-catching print. You can either supply your artwork to us, or for an additional cost our design team can work to your brief to create graphics for you. If you have any questions about our linked pop up stands, you can call one of our display experts on 0844 800 1020 or e-mail us at sales@discountdisplays.co.uk today.